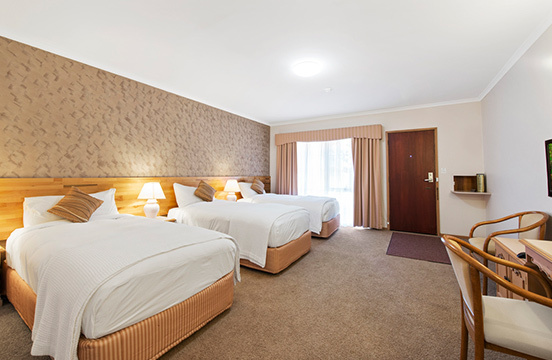 A comfortably appointed room with 3 King Single beds – all in the one room. A comfortably appointed room with 3 King Single beds – all in the one room. These rooms are fully non smoking, are on the ground floor and are located either in the courtyard or at the rear of the property. They all have electronic door locks, a wardrobe, spare pillows, a desk, a couple of chairs and have a private bathroom with shower facilities and a toilet. They also have tea and coffee making facilities, reverse-cycle air-conditioning, electric blankets, flat screen television, DVD player, in-room safe, iron and ironing board and a mini bar. This is an option if you need more beds because you are just travelling with a friend or two.